Stevens was born and raised in Durban, South Africa and played representative rugby for Western Province before leaving to study at Bath University. He soon came to the attention of the local club and made his first appearances at the end of the 2002-03 season. He went on to represent England Under-21s at the 2003 Rugby World Cup, held in Oxfordshire, impressing the first team coaches and winning a place on the summer tour to New Zealand and Australia. He made his first Test appearance as a replacement against the All Blacks before helping Bath to the top of the Premiership table in the 2003-04 season. He made his Six Nations debut in 2005 and a series of eye-catching displays led to his selection for the 2005 Lions tour to New Zealand. He played in six games for the unbeaten midweek team, but was unable to force his way into the Test side. A shoulder injury during the 2006 Six Nations would rule Stevens out for over a year, with his next international action coming in the second test of England's summer tour of South Africa in 2007. Stevens was then included in the England squad for the 2007 World Cup, starting three pool games and featuring in all others as a replacement - appearing in the final as a replacement for captain Phil Vickery. In January 2009, Stevens was suspended from all rugby after testing positive for a banned substance following Bath's Heineken Cup clash with Glasgow the previous month. He was subsequently handed a two-year ban following confirmation that metabolites of cocaine had been found in his system. Stevens was banned from training or engaging in any form of rugby activity until January 18, 2011. He devoted much of his time out of the game to a coffee shop opened with friend and Bath team-mate Lee Mears and also took up Brazilian jujitsu to maintain his fitness. Stevens confirmed in January 2010 that he would join Saracens when his ban expired and duly linked up with the English Premiership club at the start of 2011. He made his debut for Saracens and went on to a central role as the Watford-based club claimed their first Premiership title with victory over Leicester in the final at Twickenham in May. Two days later Stevens was recalled to the England setup with a place in the England Saxons squad for the Churchill Cup and the promise of a shot at securing a spot in Martin Johnson's Rugby World Cup squad. Stevens finally made his return to the senior England side as he started England's first World Cup warm-up match against Wales at Twickenham, and he did enough to secure a place on the plane to New Zealand. Following an injury to first-choice loose-head Andrew Sheridan, Stevens took the No.1 jersey. However he struggled to show his best form, especially in the scrum, as England crashed out of the tournament. Stevens kept his place in the England set-up under Stuart Lancaster's leadership and played in all five of their matches during the 2012 Six Nations - though they were all from the bench. 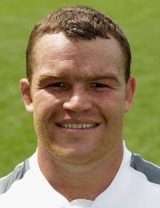 In the summer of 2012 Stevens opted to retire from Test rugby to spend more time with his young family. Even so impressive performances for Saracens and the ability to play on both the tight and loose-head side of the scrums meant that he was a surprise inclusion in Warren Gatland's Lions squad for the tour to Australia, despite not having played international rugby for over a year.